Emissions View incorporates all related emissions guidances and models into one central unified interface. Inexperienced emission inventory managers are provided guidance though a series of wizards, while advanced users are free to edit and create data with the software’s advanced options. For sources where no measurements are available, emissions can be based on processes using any of the hundreds of emissions estimation calculators for all processes contained in the US AP-42 and the Emissions Inventory Improvement Program (EIIP). These include processes in the Petroleum Industry, Wood & Paper Industry, Metallurgical Industry, Chemical Processing and others. Also included are estimation tools for mobile sources and nonroad mobile sources (construction equipment, etc.) 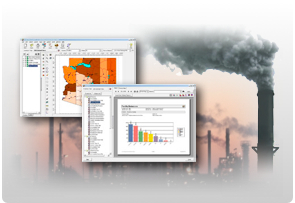 All of the estimation tools are integrated with the primary GIS interface to facilitate easy updating of the central emissions inventory and subsequent comprehensive reporting.